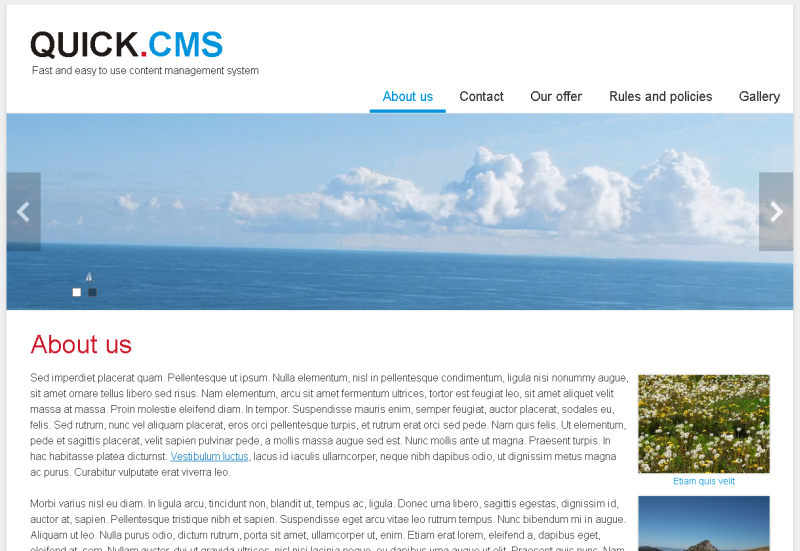 Quick.Cms is one of the simplest CMS systems, one of which that is actually worth noticing. The script works great with simple company pages, but there are some very advanced implementations. The script is free and is chosen by the designers and programmers that want to create their simple websites quickly and easily without excessive server load. It can be downloaded and viewed at www.OpenSolution.org. Quick.Cms stores data in flat files, so installation means just setting permissions for few catalogues on the server. It takes only a couple of minutes. Nature of the script allows for very simple page design modifications, which is mainly just dealing with CSS. Managing menus, pages, images and configurations does not require any special knowledge or skills. The clients who are going to manage the page should not have any problems with it even if they have no experience with CMS systems. This is so due to transparency of the administration panel and a popular WYSIWYG editor - TinyMCE. 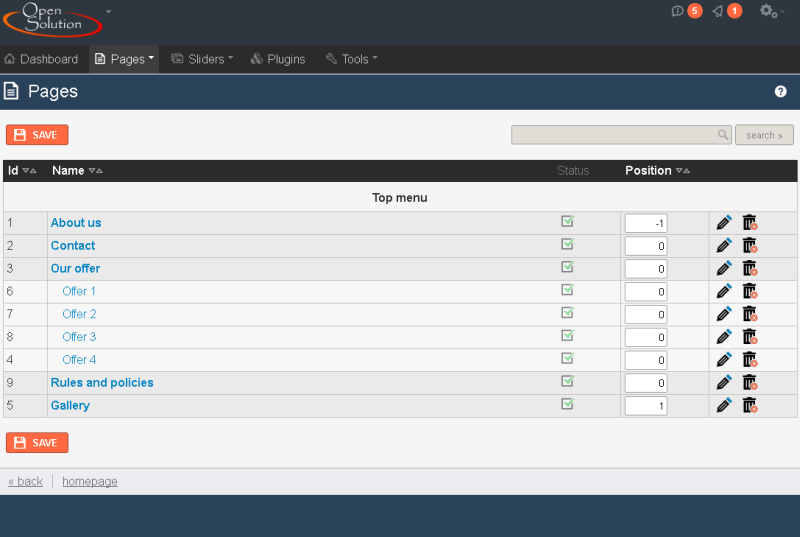 Even though this script is not as popular as other CMS systems, its community is very well developed. It's interesting to know, that creators of Quick.Cms themselves share their knowledge and support in docs, FAQ and forums. Positioning of Quick.Cms is good due to its clear HTML code, friendly links and possibility to define titles, meta descriptions and names of links for each subpage. If a script is not too developed, it can work with a high traffic because it's incredibly fast. It don't need to connect to a database such as SQL. Don't have big requirement on the server. The script takes about 1 MB of disk space. Not many systems can be said to confirm to so many standards, like XHTML 1.1, CSS, MVC and WAI (handicapped accessible pages). The last of these standards can be a significant 'pro', especially for those who want to create a public office page. Implementations like these have actually been made. The script inlcudes a built-in mobile version. When loading a page on your cell, you can choose a page version with less graphics, more content oriented instead. Quick.Cart is a script that is an extension of Quick.Cms with shopping cart functionalities. It's only a simple version of what an shopping cart could be, but the additional functionalities it provides can be used even on a regular website, when order placing options are disabled. The script does not have abundance (like thousands) of plugins and skins available in other CMS systems. 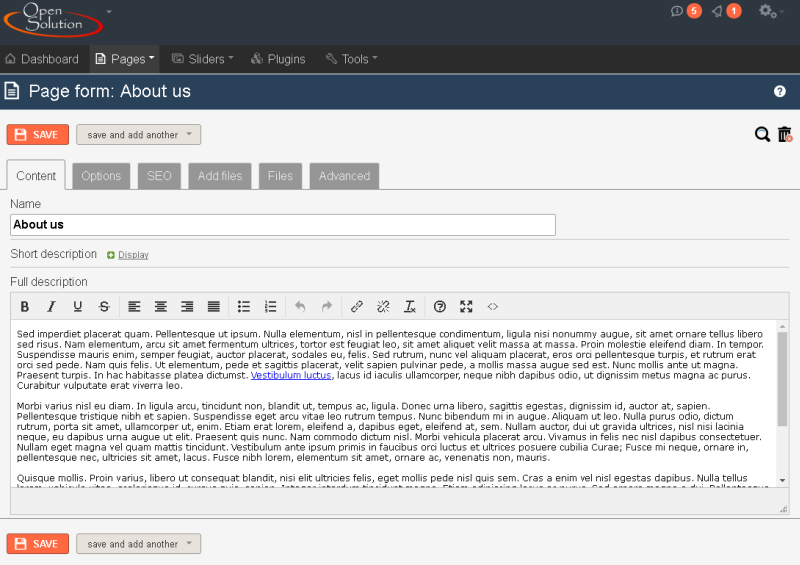 Functionalities that could compete with those of Joomla! or Drupal are available only in paid editions of Quick.Cms. The database that is an advantage for a simple website can also be a drawback when the site has hundreds of subpages. The fault is in the fact that efficiency of flat files decreases as the amount of data increases. Modifying functionalities often requires knowledge of PHP. Small number of plugins often leads to necessity of making modifications to the script yourself. So when e.g. you need an additional field in a form, it may turn out not to be so easy. Quick.Cms does not include any built-in design modification tool. Each time you try to change your page layout you need to edit templates, which luckily are quite clear. Quick.Cms is a perfect choice when you're planning on making a simple website. It's one of the easiest to use among solutions available on the internet. It requires some knowledge of HTML and CSS to set the page design, since there are not many templates to choose from. When it comes to modifying functionalities, some understanding of PHP language is also necessary. As a consolation, in this script you get a very minimalistic PHP and HTML code, what makes modifications quite straightforward. It is extremely efficient, as long as your website doesn't have hundreds of subpages. For more demanding programmers there's the paid edition or other scripts like Joomla! or Drupal. The main reason to choose for Quick.Cms is the easy-to-use admin and the database type (no SQL). So you don't have problems with installing a database. And when you have a question, just visit the support pages to find the answer you need. Interesting script. It is incredibly fast, just read this: http://opensolution.org/quick-cart-and-quick-cms-vs-other-free-systems.html. Quick.Cms is perfect tool which is distinguished by it's simplicity, functionality and administrator's panel conveniency. Shame it is not suitable for advanced solutions. I am very satisfied with this content management system. All options I looked for were easily accessible. I know only basics of html and I don't have problem with simple layout modifications. Also OpenSolution community was very helpful for me. Quick.Cms is clean and lightweight system that is easy to use and customize. Except a great CMS itself, it have nice technical support. With that script, you can quickly and painlessly build up a custom websites. New version of Quick.Cms v6 and especially Quick.Cms.Ext are a great idea for those, who offer not only small websites, but are also looking for script that are fast, stable, easy to modify. Good script for simple websites. Easy to SEO optimization and to understand by my customers. I discovered this system in 2015 and i am thinking about do more webistes based on this CMS. The best thing that can be said about QuickCMS is that it's easy for non-technical users. The developer can easily override anything. After few years of searching, trying and testing various CMS's I knew what the system I want to work with should be like and what it should include. For about 3 years I've been doing all projects to my customers on Quick.Cms.Ext. Easy to master and Easy to Use CMS. Great for small projects.